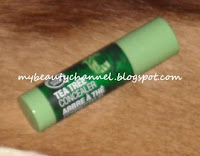 Today, I am doing a product review and I will be reviewing on the Body Shop Tea Tree Concealer! I have not done reviews for some time due to my busy schedules but I promise there will be more reviews coming. - it provides EXCELLENT coverage! It is even better than my Averine Cover Spot. - it didn't clog my pores. Ok, I am very selective when it comes to choosing any foundation and concealer because I have acne prone skin and I do not want any products that will clog my pores or cause my face to breakout. - I am using to treat and dry up existing pimples. Yes, it speeds healing because of its key ingredient tea tree oil with natural purifying antibacterial properties. - I have very fair pink skin and I am using Shade no. 2 and it is perfect for my skin tone. - it is also non-drying, thanks to the organic beeswax as a protective barrier that helps to seal in moisture. Would I buy again: Definitely! I don't think I will switch back to my Averine Cover Spot. I am already so in love with this concealer. Hi Umi. How are you? Thanks for visiting and commenting ;) Have a great day! What you are using for your face, I use the same too!! And my complexion is like what you describe yourself! I am a Singaporean, but currently staying in Europe. Climate is totally different! I heard that Kordel or Efamol Primrose Evening Oil helps complexion alot alot. What do you think?? I am just now that "Elle". I need to ask you. I have been using Averine Mineral Loose Powder for almost 2 years. It is good cos of the glitters, smooth and it covers quite well to my post acne scars. However, I am not able to buy Averine products in my place in Europe. So do you have any idea, which Loose Powder is as good as Averine? My complexion is just like what you described yourself. And I am also a fan of dermalogica and averine products. I have a sensitive skin too. Seems now dry on the inside and oily on the outside. Need your advice! ive been using averine coverspot for 2 years now...but its quite expensive..